Flight sims ain't what they used to be. Instead of dry training runs with manuals thicker than phone books, arcade action has taken a foothold and made even the most serious console flying game easy to pick up and play. 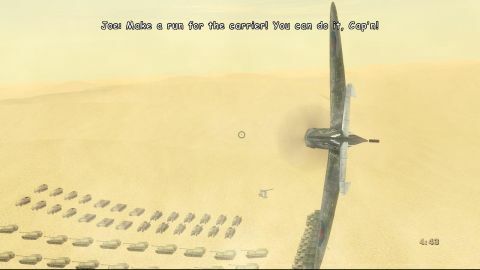 Case in point: Blazing Angels: Squadrons of WWII, which hit the Xbox 360 earlier this year and now comes to the PS3 with a few new planes, an extra multiplayer mode and tacked-on Sixaxis control. With Warhawk not making the cut for the PS3's launch window, it's up to Blazing Angels to prove that the Sixaxis tilt sensors are competent enough to control a screaming fast air fighter. The game passes the test, though it takes a few rounds in the fuselage in the process. You'll notice that the faster, more modern fighters are easier to control with the tilt mechanism; those who enjoy the game's more lumbering armored craft are advised to stick to the dual-stick analog controls, which mirror those found in the 360 version. Description Awkward and oh so frustrating - it's WWII through and through.